A revival took place again only from the 9th century under the influence of Emperor Charlemagne (742-814). Special services to the viticulture are the order of the Benedictine and Cistercian attributed. 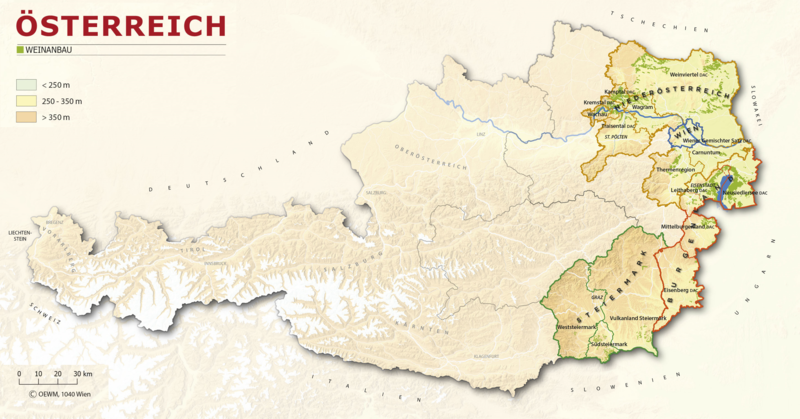 In the Middle Ages were mainly the monasteries (Kremstal) Stift Klosterneuburg (Wagram), Stift Melk (Wachau) and Stift Heiligenkreuz (Thermenregion) Carrier of the viticulture culture. This also made a significant contribution Dinstlgut (Wachau). The oldest Austrian winegrowing regulations with regulations regarding working hours and stipulated punishments in case of grape theft stems from the Habsburg Duke Albrecht II (1298-1358) from the year 1352. Already in the Middle Ages there was also a classification into wine quality classes. Under Maria Theresa (1717-1780) orders were issued for the use of cheap wine. It originated many vinegar-settlers, liquor distilleries and mustard production , Under Emperor Josef II (1741-1790) was allowed on 17 August 1784 in a written decree, the own made at place also to sell in your own house. He thus laid the foundation for the this year, In the 19th century, there were some disasters. An extreme cold snap, imported from America fungal diseases, as well as a negative climax the phylloxera devastated whole wine-growing areas. The pest probably reached Austria in 1867, when August-Wilhelm Freiherr von Babo (1827-1894), director of the founded in 1860 Klosterneuburger Weinbauinstituts, from Germany got American vines.